Highly decorative in a variety of spaces, our Murano glass Fazzoletto-styled Zanfirico Hanging Lamps are one-of-a-kind pieces designed to enhance any room decor. 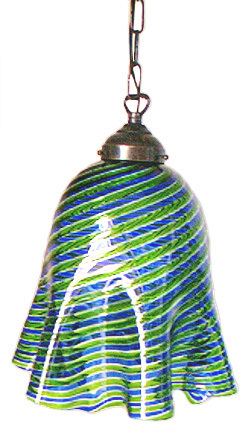 This 8 1/2 inches tall lampshade of swirling blue and green comes complete with an attached four foot chain for easy installation. Recommended for use with a 60 Watt bulb. Handmade in Venice, Italy in the former LaFenice Furnace.